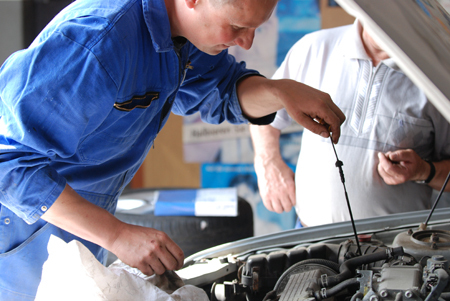 Routine maintenance on your vehicle is the key to extending the life of your car or truck. One of the most routine, but necessary, services you need is to have your oil changed on a regular basis. Why is it so important? Because your engine is made up of many moving parts and they all need to be properly lubricated to cut down on the amount of wear and tear that can be caused due to friction. The mechanics at Cartech Automotive & Transmission Repair are ready to provide you with an oil change in in San Antonio, TX. Whether we are performing a standard oil change service or a synthetic oil change service, our team provides you with the right oil you need to keep everything running smoothly in your engine. Not only that, but we can also perform any other maintenance services you may require, including suspension and alignment services. A year’s worth of oil changes is a drop in the bucket compared to how much you could end up paying in engine damage caused by an under-lubricated engine. This important oil change service is a very affordable way to avoid major repair bills while also providing you and your engine with a decent amount of benefits. The pistons, valves, and other parts in your engine receive the lubrication they need thanks to our oil change services. This not only helps to reduce the amount of friction between parts, but also keeps your engine components cooler, which reduces wear and tear significantly. Your engine’s oil is also used to remove wear particles and sludge from its system. By keeping your engine clean you can avoid potential corrosion while improving your overall gas mileage. Any way you look at it, routine oil changes are one of the smartest investments a driver can make in keeping their vehicle running properly. An oil change, just like most other preventative maintenance services, is very affordable. Especially when you compare the cost of this service to the amount you might need to pay in repairs if you don’t receive routine maintenance. To make it even easier for you to receive the maintenance you need to keep your vehicle up and running, our mechanics are proud to offer our clients free estimates. Contact us to schedule your upcoming regular or synthetic oil change service. Our mechanics work hard to provide routine maintenance for clients located throughout the communities of San Antonio, Helotes, Leon Valley, Pipe Creek and Bandera, Texas.